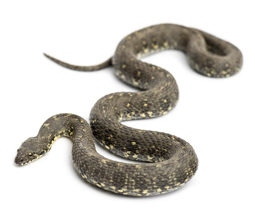 Some snakes live in rocks, rivers, water, grasslands, caves, and holes. Some desert snakes live under the sand. Snakes can live in Asia, Europe, North America, Africa, Australia and South America. There is no limit to the food items that you can even think of a snake might eat. Some of the snakes eat aquatic plants apart from eating fish. Rodents serve as the important prey for most of the snakes. Note that it is a mammal. Snakes use their venom and constriction to kill the mammals and this method is well suited to kill the mammals before they eat. That could be one of the reasons for them to eat mammals mostly. The other food that they prefer to have is other snakes. It is easy to swallow other snakes since they easily fit their long body. Snakes occasionally enter houses, generally by accident. Cats have been known to catch small snakes and bring them home. Snakes do not breed in houses but have been known to lay eggs in or under foundations. If a snake has been seen, that snake needs to be removed and its entrances sealed. Remember that snakes can pass through extremely small openings usually entering near or at ground level. Cellar doors, windows and screens must fit tightly. Walls and floors should be searched for crevices. The masonry of foundations, fireplaces, and chimneys should be inspected and, if necessary, be plugged.